Eight different varieties of trees were recently planted on the southern slopes of Culp’s Hill and in the Spangler’s Spring area. The monument to the 1st Maryland Potomac Home Brigade (USA) is in the left background. 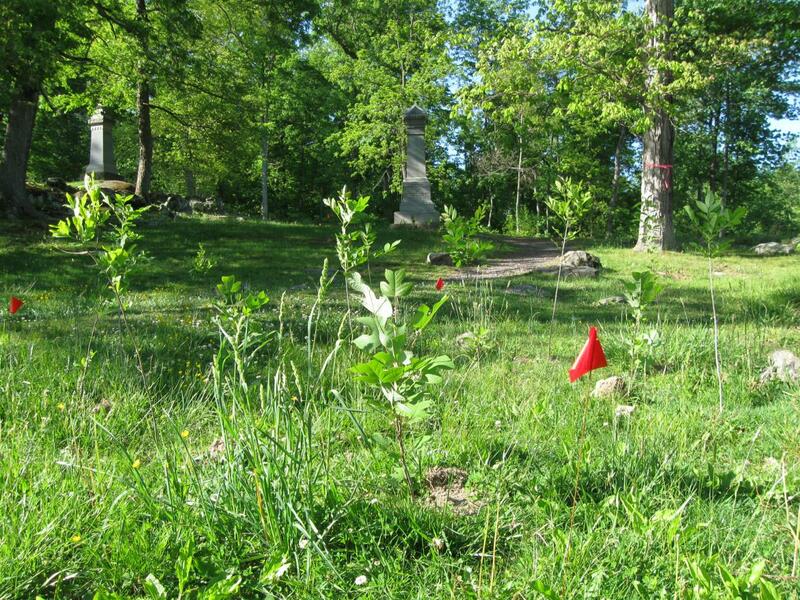 The monument to the 107th New York Infantry Regiment is in the background above the new trees marked by the red flags. This view was taken facing north at approximately 5:00 PM on Monday, May 10, 2010. 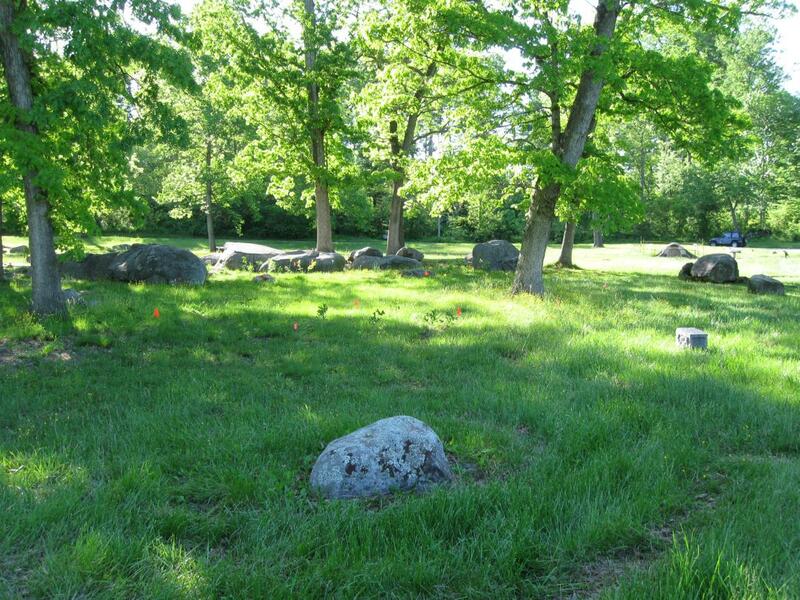 For approximately the last ten years, Gettysburg National Military Park has attempted to put the battlefield closer to what the soldiers saw in 1863. One of the primary purposes for the establishment of the National Military Park was military study by the U.S. armed forces. 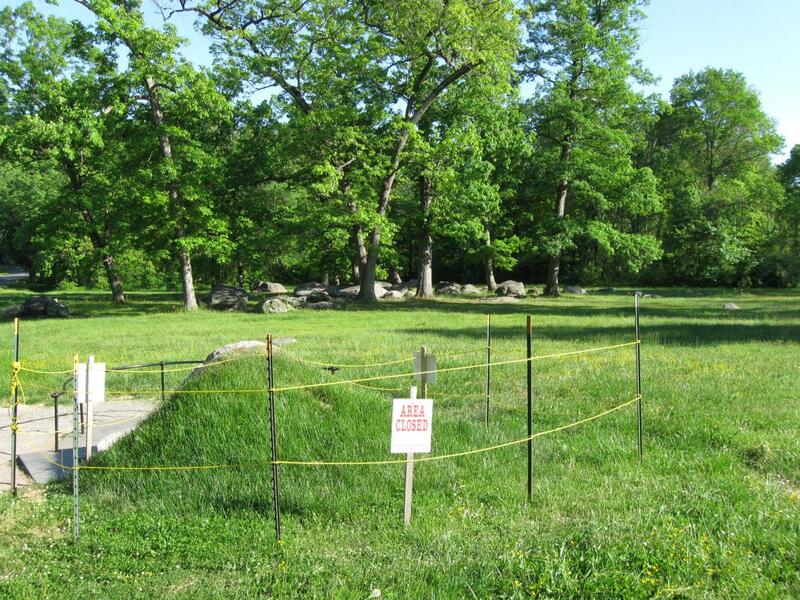 Some controversy has occurred as the National Park Service has cut down trees that were not in locations where they were in modern times, and other controversies developed as the National Park Service cut down some “witness trees” that were alive during the Battle of Gettysburg, July 1-3, 1863. 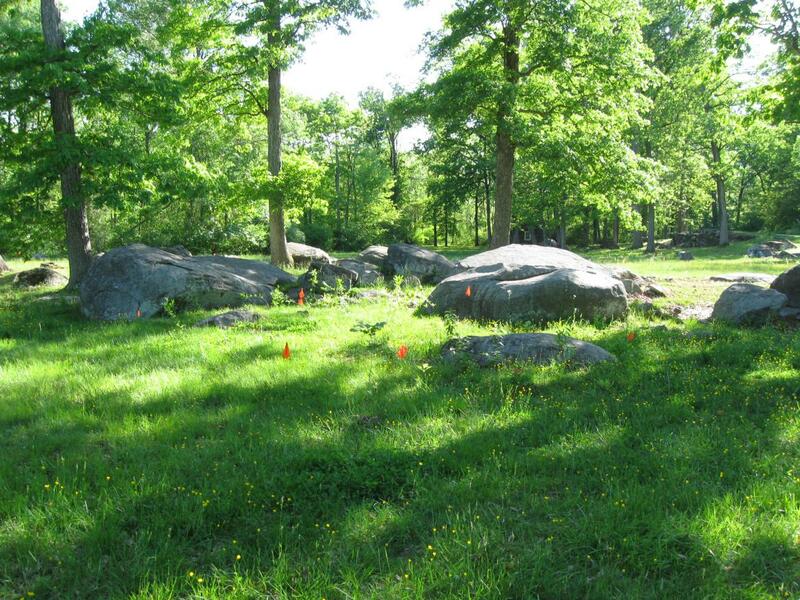 However, the National Park Service is also replanting trees in locations where they were located during the battle. Over 14,000 trees and bushes have been replanted. 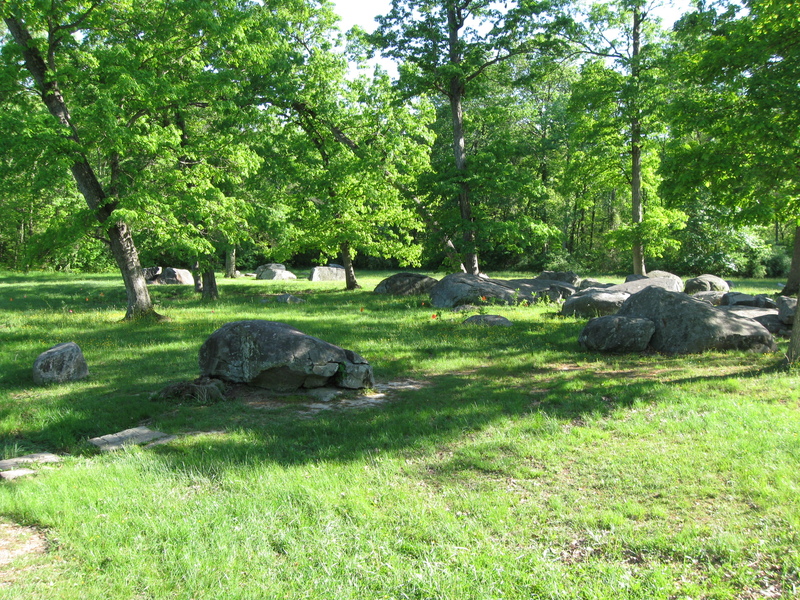 One area in Gettysburg NMP that has recently had trees replanted is the area around Spangler’s Spring and the southern section of Culp’s Hill/Spangler’s Hill. We left the Spangler’s Spring parking area and walked up the southern section of Culp’s Hill as we began our tour of the new trees. 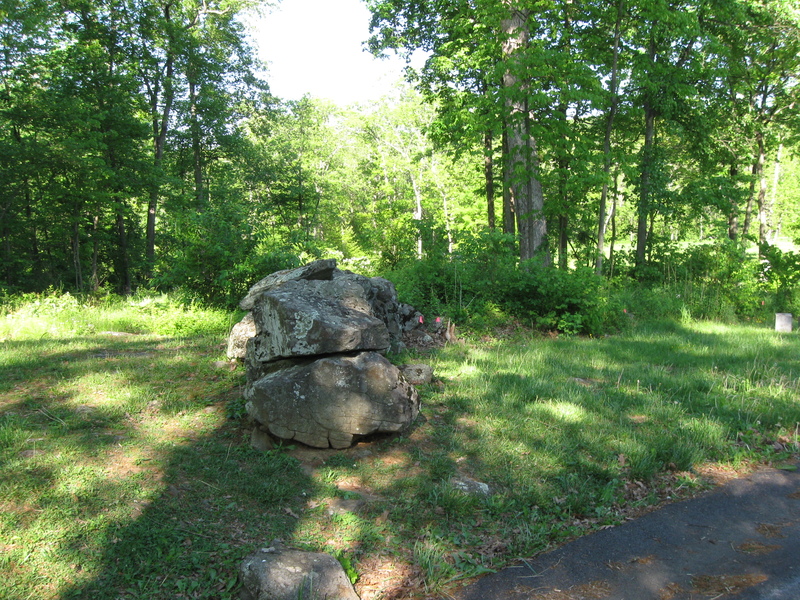 The monument to the 1st Maryland Potomac Home Brigade (USA) is at the top of the hill. Below it on the slope are some new trees, some of which are marked by small white flags. This view was taken facing northeast at approximately 5:00 PM on Monday, May 10, 2010. We’re now near the monument to the 1st Maryland Potomac Home Brigade (USA) looking towards Spangler’s Spring, which is on the other (west) side of Colgrove/Slocum Avenue. 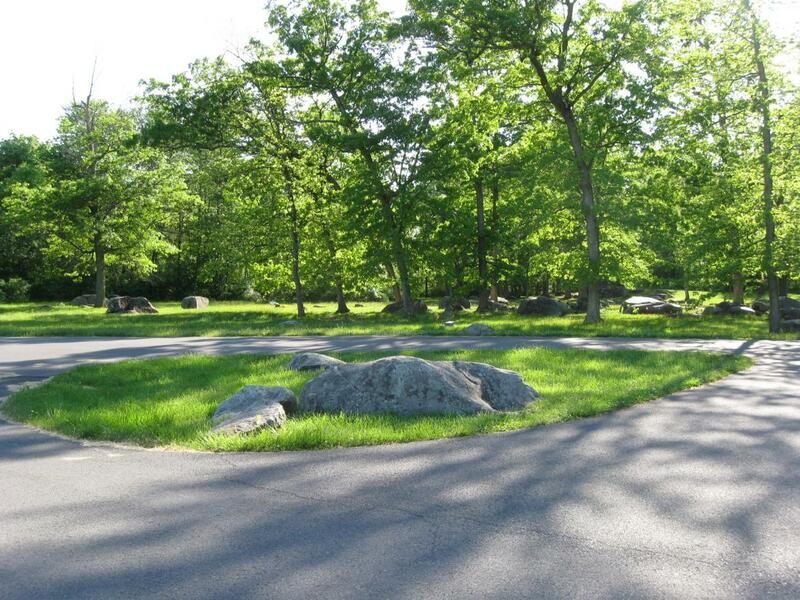 The Spangler’s Spring parking area is on the left. The trees are on the slope in the foreground. This view was taken facing southwest at approximately 5:00 PM on Monday, May 10, 2010. Looking down the slope towards the monument of the 107th New York Infantry Regiment. 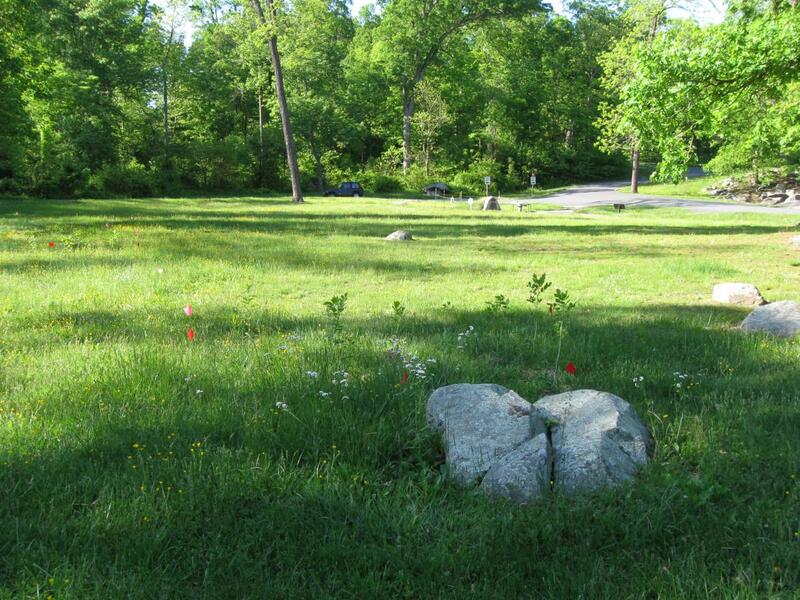 The Spangler’s Spring Parking Lot is to the right of the monument. 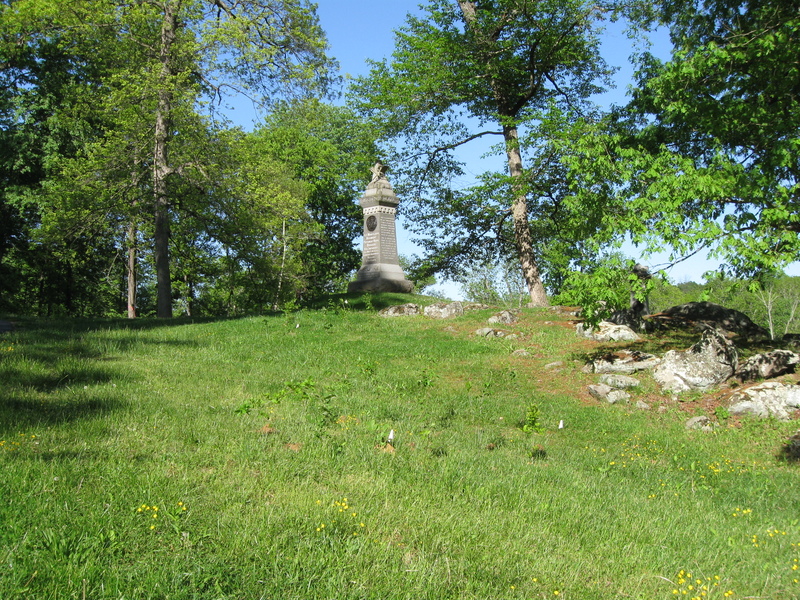 The Indiana State monument, in Spangler’s Meadow, is in the left background. This view was taken facing south at approximately 5:00 PM on Monday, May 10, 2010. 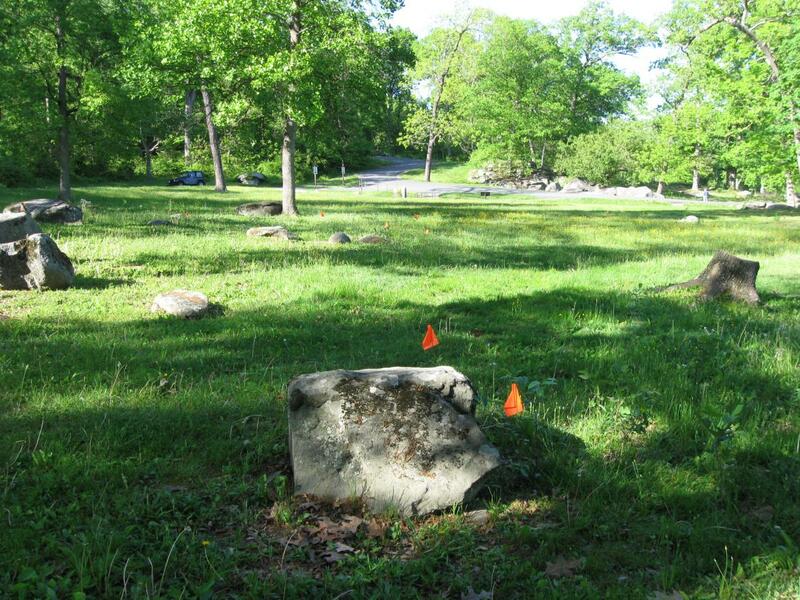 The stone wall that is on either side of Slocum Avenue at this point appears to be the northern boundary line for the new tree planting. 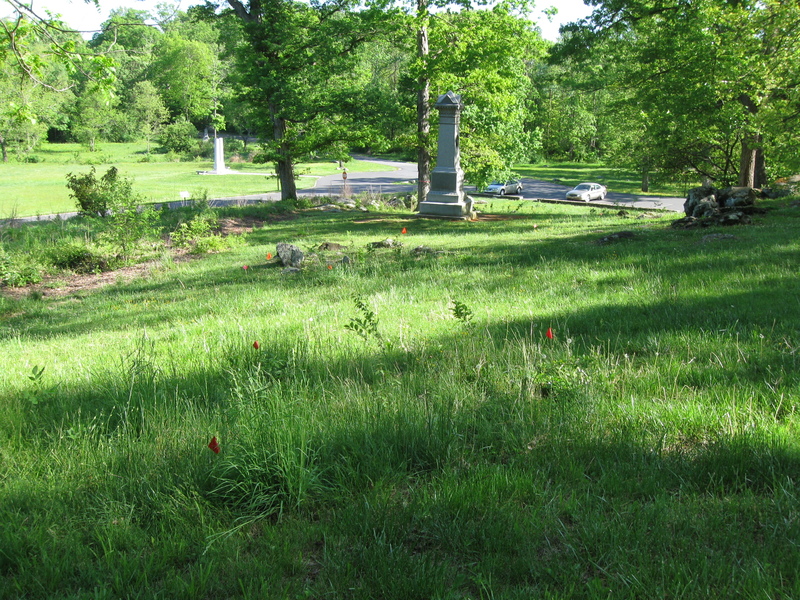 On the left (north) of the wall (Culp property at the time of the battle) no new trees were planted. 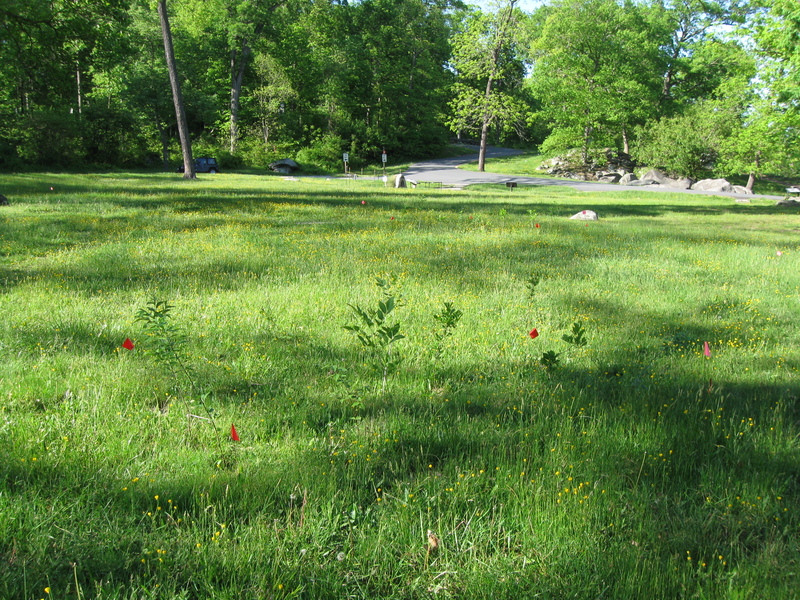 On the right (south) of the wall (Spangler property at the time of the battle) the new trees were planted down the slope. This view was taken facing east at approximately 5:00 PM on Monday, May 10, 2010. We’re now near the Spangler Spring parking lot. 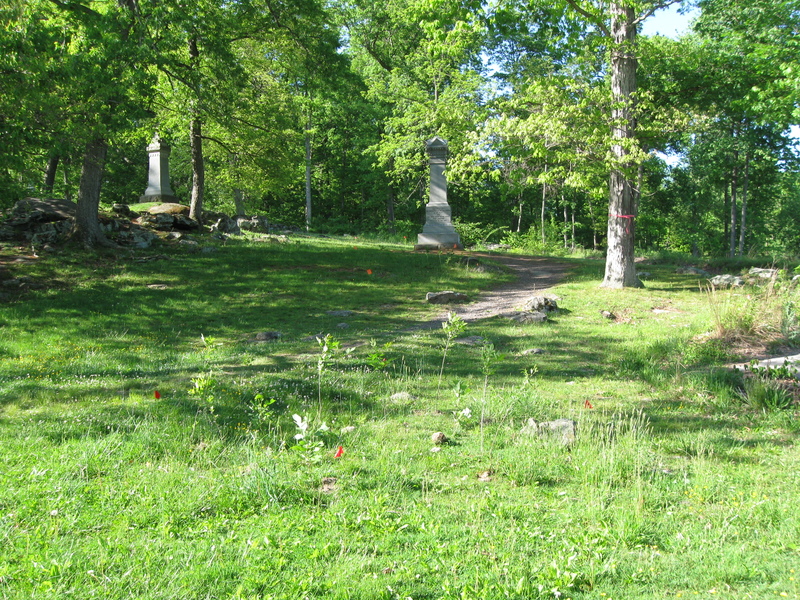 The 1st Potomac Home Brigade Monument (USA) is in the left background, and the monument to the 107th New York Infantry Regiment is in the center background. This view was taken facing northeast at approximately 5:00 PM on Monday, May 10, 2010. They have also replanted trees in the Spangler’s Spring area west of Colgrove Avenue. This view was taken facing south at approximately 5:00 PM on Monday, May 10, 2010. To give you a better idea of where the trees were planted in this area, we’ve moved to East Confederate Avenue where it forms a junction with Colgrove Avenue, which runs from right to left in the background. The Indiana State Monument is out of sight on the right. Above the rock in the foreground and to the right, tree planting has occurred. To the left of the rock in the foreground, where Living History demonstrations have traditionally been conducted, no planting has occurred. This view was taken facing southwest at approximately 5:00 PM on Monday, May 10, 2010. According to National Park Service spokesperson Katie Lawhon, the trees recently planted include: black cherry, sassafras, black gum,tulip poplar, silver maple, pin oak, green ash, and sycamores. This view was taken facing southwest at approximately 5:00 PM on Monday, May 10, 2010. 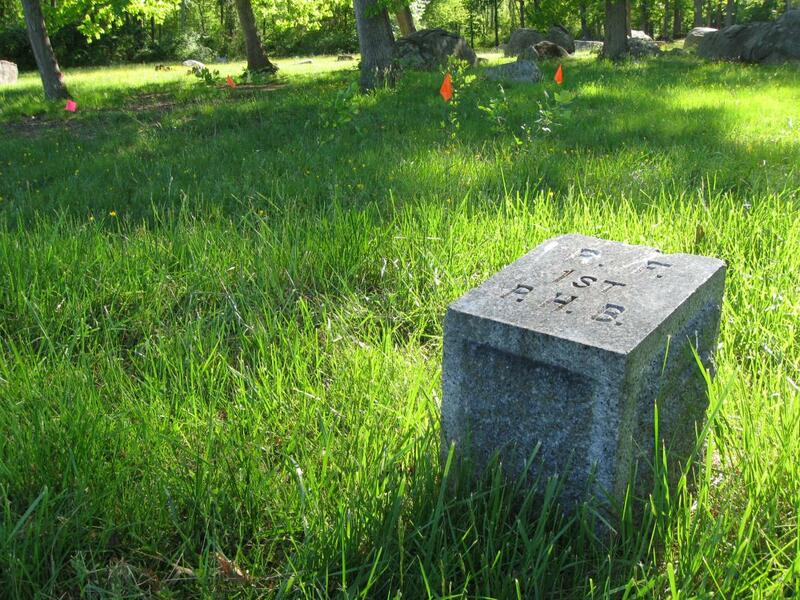 The right flank marker for the 1st Maryland Potomac Home Brigade USA. This view was taken facing southwest at approximately 5:00 PM on Monday, May 10, 2010. Spangler’s Spring is in the right background to the left of and below the jeep which should have been parked somewhere out of sight. This view was taken facing northwest at approximately 5:00 PM on Monday, May 10, 2010. A couple of strips of trees were planted in the open ground near Spangler’s Spring which is directly above the rock in the foreground. One strip leaves the rock and goes into the left background (southeast on the right, northeast on the left). We will follow that strip for approximately twenty yards and… This view was taken facing north at approximately 5:00 PM on Monday, May 10, 2010. 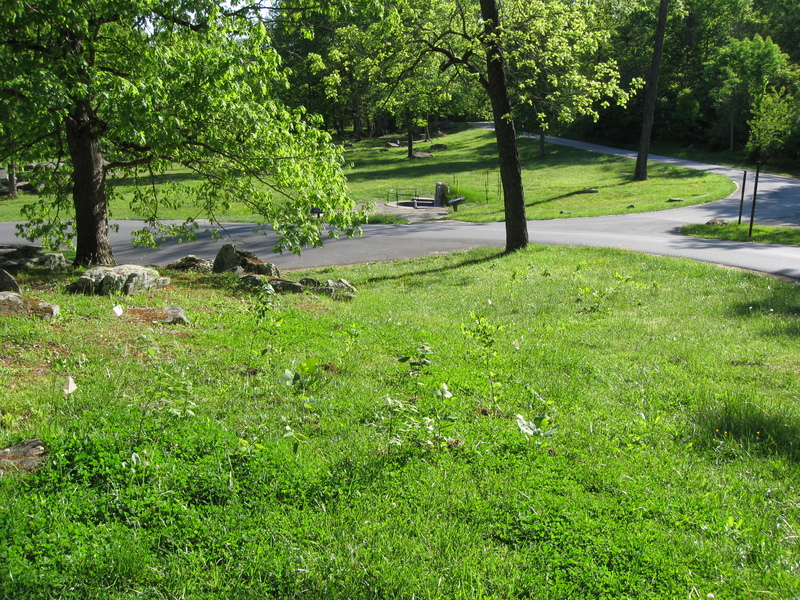 …another strip goes from here across the open ground towards Spangler’s Spring (southwest to northeast). This view was taken facing northeast at approximately 5:00 PM on Monday, May 10, 2010. We’re now near the end of the southeast to northwest strip of trees looking back toward the rocks. 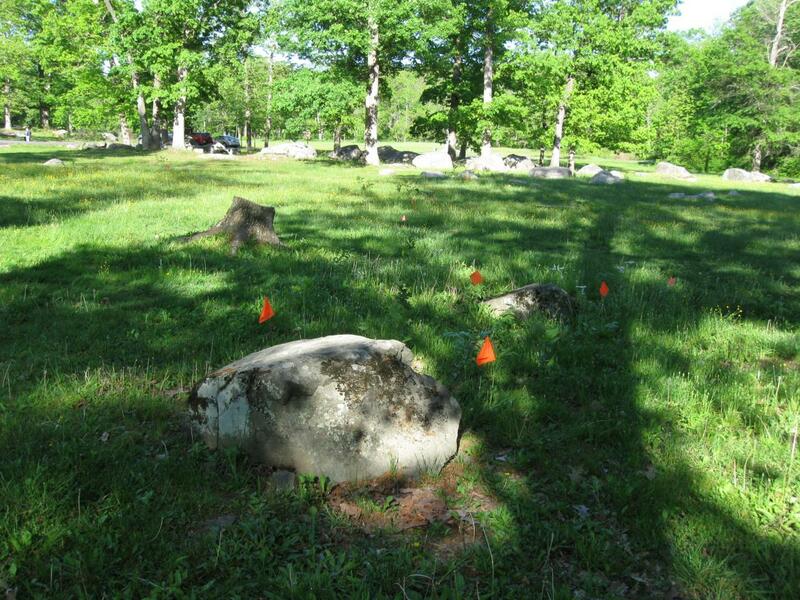 Notice the rock in the foreground with the two orange flags. This view was taken facing southeast at approximately 5:00 PM on Monday, May 10, 2010. We will now view the rock in the foreground with the two orange flags from another angle. We are now looking towards Spangler’s Spring on a line where another southwest to northeast strip of trees is being planted. This view was taken facing northeast at approximately 5:00 PM on Monday, May 10, 2010. By the way, the back (north) of the Spangler’s Spring Monument is closed so that the grass can grow. This view was taken facing southeast at approximately 5:00 PM on Monday, May 10, 2010. Tree Cutting Between the Baltimore Pike and Spangler’s Spring on March 11, 2009. James McAllister Farm Tree Cutting Update on April 16, 2009. Culp’s Hill Tree Cutting Part 1: Spangler’s Lane on September 27, 2009. Culp’s Hill Tree Cutting Part 2: The Ravine on September 28, 2009. Culp’s Hill Tree Cutting: Northeast Slope of Culp’s Hill on November 17, 2009. Spangler’s Spring Tree Cutting (Lack of Tree Cutting) Update on November 21, 2009. Gettysburg’s February 10th Snow Storm: Spangler’s Meadow & McAllister’s Woods on March 22, 2010.